If you aren't a subscriber, we highly recommend it. Like every issue, this one contains some fantastic recipes and we'd like to share one of them. It's called the Pontarlier Julep. Not long ago we made some great rhubarb-infused vodka. What I never shared was that in addition to the vodka, I also infused some gin. I figured that while the rhubarb was still available I might as well try it. 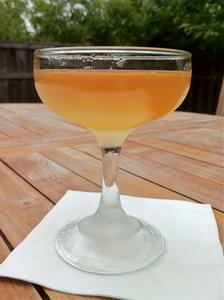 Then the May/June 2001 issue of Imbibe Magazine came out and there was a nice recipe for Rhubarb Bitters. Yep, I made that too, and as recipes go, this was not much more than chopping up some stuff and throwing it into a jar for a couple of weeks. This week I am featuring a cocktail that has been a long time coming and usually ranks as a favorite among cocktail enthusiasts. Actually, I posted the original recipe for this cocktail last year, but this version is a little more accessible. In fact, it includes one of the first homemade ingredients I ever made. 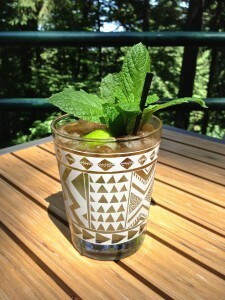 Once you've whipped up a batch of special syrup, you can finally mix the Drink Of The Week, the delicious Mai Tai. Well, it's Mardi Gras week, and although we just finished celebrating the Winter Carnival here in St. Paul, New Orleans is just getting started with their own annual festival. This year the new Superbowl champions have another reason to celebrate. But in addition to the parades and the street parties, New Orleans has always played an important role when it comes to cocktails.